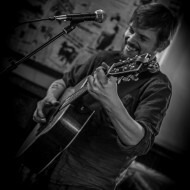 Ross Dransfield is a local acoustic guitarist and singer-songwriter. He appears regularly playing at Indigo Alley alongside other venues, and occasionally guest-hosts open mics (such as Cellars and the Tap & Spile, where we meet for this interview). He will be performing at this year's Acoustic Gathering. Tell us about how you got started with music. I started out as a DJ, from about the age of 14 or 15, I was really into house music and had about three different pairs of decks... then I went to do Creative Music Technology at Westwood College when I was 19 and suddenly just fell in love with guitars - I sold all my decks to buy one. I didn't have any tuition in guitar, but because I'd been singing - through presenting karaoke - felt I wanted to move towards creating music and a guitar seemed the right option for me. I knew I wanted to write songs, piano would have been another option but then they aren't so easy to take to gigs! I actually borrowed a guitar from my girlfriend at the time, before I bought mine, and learning was really just buying some songbooks and watching the occasional YouTube video, but practicing as much as I could. My first song was literally just three chords! But I wanted to start writing straightaway, the guitar was a tool towards that. Has anyone been a particular influence on you? So many people in Scarborough - John Watton, his open mic, I had my first outing at Cellars - think I played Radiohead's Karma Police! John's definitely a big influence, he's all over the guitar, you always want to know your instrument the best you can know it, watching him, it's inspiring. Jesse Hutchinson too - he's awesome. I try and watch his fingers and see what he's doing, take notes! The route to my progression was just me spending time, honing my skills; I still think there's always more to learn. Beyond local acts, I'm a Neil Young fan, and cover several of his works. I aim to get some chords I like first, play around with them and then hopefully the music itself is enough of a movement that the lyrics are sort of secondary. Usually, I have the idea of what I want to write, but the chords come first and it progresses from there, so its just trying to craft that all together - honing and refining. Your music, covers and original, cross a range of genres - how would you describe yourself? Acoustic Alternative. That about covers it! This is your second time at Acoustic Gathering, how are you feeling about it? For anyone who saw you then, what is going to be different this time? It's exciting, yeah, good to be on the bill again - it's about three years since my first appearance there - and great to see lots of local acts performing. I think that's the way to go because there's loads of local talent to pick from, it should be a celebration of local talent, on an awesome stage that I imagine most people would love to play on. I've definitely improved songwriting-wise, all but one of the songs has been written since then; there might be one or two covers in the set, but ultimately it's an opportunity to showcase my own stuff. So I just hope people enjoy the music. Ross Dransfield is on stage on Sunday, 8th September at 3.30pm at Acoustic Gathering in Peasholm Park, Scarborough.